Illumion is a Dutch progressive rock group, formed around guitarplayer Eveline van Kampen. With 'The Waves' she follows up on their debut 'Hunting For Significance' from 2009. That van Kampen is conservatory trained and likes to listen for example to bands like Fates Warning is audible. The mainly long tracks are of complex structure and dressed with an (easy) jazzfusionstyle and influence from the Spanish and Chinese musical culture. The sliding basstones feature prominently and the synthesizer arrangments take care of the traditional symphonic input and sound. 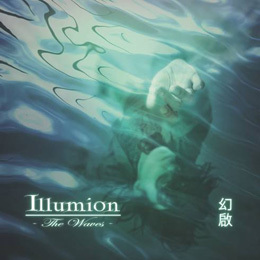 Illumion creates, through their experimental zeal, a mystical, sometimes even exotic, world, where a dreamy atmosphere is added by singer Esther Ladiges. Ladiges has something enchanting and, on this new disc, often reminds me of Flemish singer An Perlié. Despite all the musicality the feeling kreeps up to me that 'The Waves' sounds to clean and schooled, and that not all of the the tension and surprise elements are expressed to their full potential. This is a pity seeing the musical talent of this band.